As celebrities take their fashion statements to the red carpet at the Aria Awards, many pulled out all the stops to ensure their looks were nothing short of glamorous. 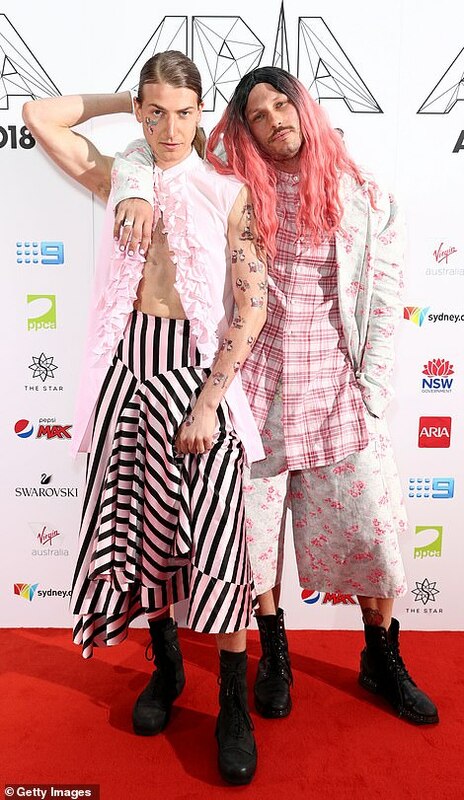 And the night of all nights in the Australian music industry has become notorious for stars to take a fashion risk to be a little daring and creative with their wardrobe choices. But unfortunately for some, they didn’t win the best-dressed category as they braved the wild weather in Sydney for the event at The Star on Wednesday. From outrageous outfits to barely there ensembles, FEMAIL looks at the most daring, bizarre and notable sartorial disasters after some stars failed to hit the high notes with their chosen red carpet ensembles. Leading the list of this year’s worst-dressed stars is radio shock jock Kyle Sandilands’ long-term girlfriend Imogen Anthony, who stepped out in a bizarre barely there ensemble. The 27-year-old – who tied her hair extensions into pigtails – donned a bespoke tape- inspired outfit with racy tie detail at the side – and she finished her look in a pair of very risque thigh high black boots. Also missing the mark was E! Australia host Ksenija Lukich, who failed to compliment her enviable figure after she opted for a silver tasselled number with an awkwardly high split from behind. Despite sporting a flawless complexion, the tinsel-inspired gown looked unflattering on the 28-year-old model. Sydney singer-songwriter Montaigne made a bold fashion statement in an eccentric feathered frock. The loose-fitting gown swamped her svelte figure, as she appeared on the red carpet with the words ‘Stop Adani’ written across her cheeks in protest to stop the coal mine from threatening the Great Barrier Reef. Unfortunately the two piece neon yellow suit didn’t do justice for actress Chloe Bayliss. The 27-year-old appeared to go braless in the plunging blazer neckline. Not a stranger to making bold fashion statements on the red carpet, Christian Wilkins sported a pastel pink ruffled shirt left undone, a striped skirt with a hemline of varying lengths and black lace-up boots. Despite looking stunning in the ruffle feathered bodice, Nicole Kidman slightly missed the fashion mark with her unusual choice of silver pants. After landing on the worst-dressed list last year for her questionable outfit, singer Jessica Mauboy has once again failed to hit the fashion mark when she opted for bizarre white puffy sleeves.